The Beatles (I Feel Fine) 1965 Live. I’m in love with her and I feel fine. I’m so glad that she’s my little girl. That her baby buys her things, you know. She’s in love with me and I feel fine, mmm. Confidence is the foundation of success. For instance, John Lennon introduced their newly written song “I Want To Hold Your Hand” to producer George Martin by saying “You’d better come on down here and have a listen to our next number one record.” His confidence led directly to the success of that song, which not only shot to number one in Britain but was the crucial track that broke them in America and sky-rocketed them to international fame. 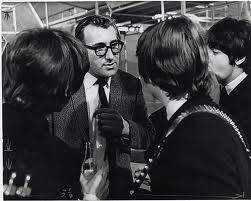 The song John was describing above was “I Feel Fine,” which wound up ending 1964 with a great big bang! It spent five weeks at number one in Britain and, after their previous three American singles failed to crack the top ten (see “I’ll Cry Instead,” “And I Love Her” and “Matchbox“), this song catapulted them back to number one on the American charts for three weeks. Even the single’s b-side “She’s A Woman” peaked at number four on the charts, their highest b-side charting yet. Nearly every future Beatles single released after this in the US during their career also made it to the top spot. So, in this case, John’s uncertainty about “I Feel Fine” led to pulling them out of a slight lull in their American success and cementing them in the number one spot on the American charts for the next six years. I guess the song wasn’t quite as “lousy” as John originally thought! One thing that is for certain is that it was based on a guitar riff from a favorite song of Lennon’s. “The guitar riff was actually influenced by a record called ‘Watch Your Step’ by Bobby Parker,” George Harrison explained in interview. “But all riffs in that tempo have a similar sound. John played it, and all I did was play it as well, and it became the double-tracked sound.” Lennon elaborated, “‘Watch Your Step’ is one of my favorite records. The Beatles have used the lick in various forms. The Allman Brothers used the lick straight as it was,” as evidenced in their song “One Way Out.” The Beatles were quite familiar with “Watch Your Step,” as they included it in their live performances during 1961 and 1962. As for the time of its writing, John’s comment about the song being written “at a recording session” may very well be true, but not at the same recording session that the song was recorded. During the October 6th, 1964 session that The Beatles recorded “Eight Days A Week,” John was already going over the distinctive guitar riff of “I Feel Fine,” which can be heard in between takes. Therefore, McCartney must have gotten together with John to finish off the song sometime between October 6th and October 18th, 1964, when the song was actually recorded. One thing that is for certain is that it was primarily John’s song with a little help from Paul, most likely on the bridge. October 18th, 1964 proved to be a marathon recording session for The Beatles, since it was quite apparent that they needed to complete a good number of songs to fill a new album and single before the end of the year. Therefore, they met in EMI Studio Two from 2:30 to 11:30 pm on this day, the result being the completion of eight songs, five of which were quickly-recorded cover songs. The squeal mentioned above is, of course, the sound heard at the beginning of “I Feel Fine,” the explanation of which has become legendary and has been related from many sources in many ways. Early quotes from The Beatles made most think that this was a pure accident that happened during the recording of the song and was kept on the record. While this makes for an interesting story, it simply was not the case. What Paul failed to mention was that this accident occurred during the recording of “Eight Days A Week” and not “I Feel Fine.” And it wasn’t until twelve days later that The Beatles got their way in including this on a Beatles recording, but it wasn’t edited in at all. 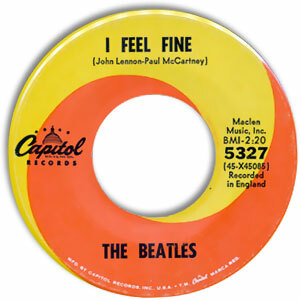 All of the recorded takes of “I Feel Fine” on October 18th started with the well-rehearsed feedback which ushered into John’s introductory guitar riff. At approximately 4:30 pm at the October 18th recording session, The Beatles recorded their first take of the song. 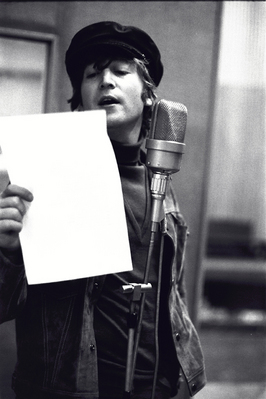 After the feedback was recorded, John was seen having a little trouble singing the song for more than one reason. First of all it was in a key that was too high for him to comfortably sing and, second of all, he found it difficult to sing and play that distinctive riff at the same time. 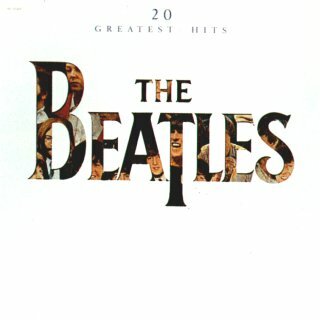 The song broke down after about a minute, resulting in The Beatles remedying at least one of the problems by the time take two was attempted. This second take brought the song down to a lower key which helped John somewhat, but it was still awkward to play and sing simultaneously. They did get through the solo section, but the guitar solo wasn’t worked out yet so George just played the riff along with John during this section. Unfortunately, this take also broke down shortly thereafter. Take Five appears to be the first complete version of the song, although it still wasn’t satisfactory for overdubs. Before Take Six begins, we can hear George Harrison rehearsing the guitar solo he will perform as an overdub a little later. This take shows The Beatles resolving the second issue regarding John’s performance, the solution being them just recording a rhythm track without John’s vocals, which would then be recorded afterward as an overdub. This take is also complete, but not satisfactory. Three attempts later, on Take Nine, they performed their best rhythm track, feedback and all. Over this, John recorded his vocals and then double-tracked them as well. Other overdubs include Paul and George doing harmony vocals as well as George’s guitar solo. 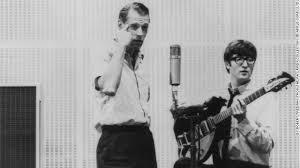 Three days later, on October 21st, 1964, George Martin and engineers Norman Smith and Ron Pender entered Room 65 at EMI to create four mono mixes of “I Feel Fine.” The first two were left unreleased, while the third was prepared for the British single and the fourth was intended for America. The British mix had just a touch of reverb while a little more reverb was added for the American mix, as that was what Capitol Records apparently wanted. This didn’t appear to be enough, since it is reported that Capitol added even more. The same EMI staff entered the control room of EMI Studio One the next day, October 22nd, to create a fifth mono mix, although this was never used. 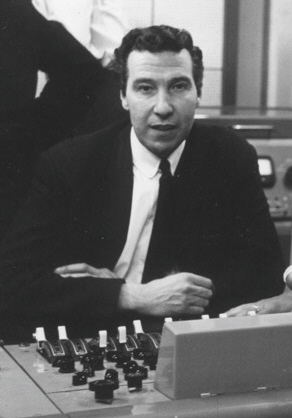 Even though a stereo mix of the song wasn’t required at this time, since it was only slated to be issued as a mono single, a stereo mix was nonetheless made on November 4th, 1964 by George Martin, Norman Smith and 2nd engineer Mike Stone in the control room of EMI Studio Two. This quickly-done mix included a second or two of whispers and quiet noises just before the song begins. While most releases edit this out, the whispers are contained on the British compilation album “The Beatles/1962-1966” (aka “The Red Album”). “I Feel Fine” was put to tape on two other occasions in 1965 during the live recordings made at their Hollywood Bowl concerts on August 29th and August 30th. Plans were being discussed to release a live album at this time, although it didn’t materialize. 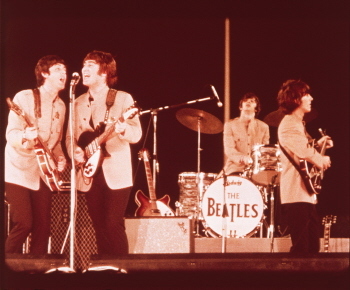 Seven of the songs recorded on their August 30th show did eventually get included on the 1977 “The Beatles At The Hollywood Bowl” album, but “I Feel Fine” was not one of them. The song’s structure contains a heavy amount of components due to the brevity of each section. Each of the five verses is only ten measures long while both bridges are eight measures long. A fourteen measure instrumental section is also featured as well as an eight measure introduction and a ten measure conclusion. Not including the feedback experiment of undefined length preceding the introduction, what results is a “intro/ verse/ verse/ bridge/ verse/ instrumental/ verse/ bridge/ verse/ outro” structure (which becomes aabacaba minus the intro and outro). 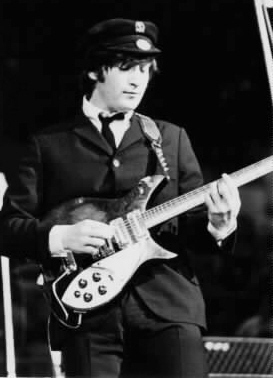 After the feedback experiment, the length of which was determined by whenever Lennon decided to start playing (the various takes of the song show somewhat different lengths), John introduces the song’s guitar riff, which is its most distinctive feature. He starts it off in D, falls down to C, and then hits the home key of G, which then signals the band to come in for the last two measures of this eight measure introduction. John begins the first ten measure verse with a fast-paced vocal melody line which stays in the home key of G for the first four measures, rising to D on the words “she said so.” The verse rounds off with Paul and George harmonizing with John on the key phrase of the song “I’m in love with her and I feel fine,” which follows the tried and true formula of ending the verse with the title of the song (see “Love Me Do,” “From Me To You” and “And I Love Her” among many others). The second verse comes next, which is a virtual repeat of the preceding verse except for the lyrics of the first four measures. Afterwards, the three part harmony remains intact to usher in the eight measur e bridge, which emphasizes the labored half-note melody lines on the words “I’m so glad” and “she’s so glad,” deviating from the fast moving melody lines heard in the verses. John completes each of the above statements by himself, accentuated by Paul and George’s harmonized “ooh” in the background. Ringo also makes the bridge unique by utilizing his trademark sizzling hi-hats, which are only heard during the bridges of the song. The bridge takes us comfortably into the third verse to complete the compositional length of the song. This time the ending phrase is altered to “she’s in love with me and I feel fine.” John then utters a muffled but transitional moan to introduce the instrumental section of the song. This fourteen measure instrumental section is actually a composite of two parts, the first being a guitar solo by George Harrison in the framework of a verse. After six measures of this, the band drops out, leaving John to repeat the introduction of the song with his descending guitar riff from D to C and then G. When John lands on the first G chord, Ringo introduces the band to join in with a full measure syncopated Latin-sounding drum fill. They join in for the final two measures of this instrumental section, which naturally transcends back into a repeat of the second verse. We complete the original framework of the song with an identical repeat of the bridge and third verse. This final verse is extended by a ten measure conclusion which also is divided into two parts. The first part is a repeat of the final four measures of the verse, re-emphasizing the title of the song in order to drive home this catch phrase as a summary of its message. On the downbeat of the third measure, the band once again disappears to leave John’s trademark guitar riff fading off into the sunset. The only other elements of the remaining measures of the song are John’s moans (as heard just before the guitar solo) and Paul barking like a dog (for some strange reason). As for musicianship, Lennon is in top form. Fronting the band with his rambling excellently played guitar riff, he also sings lead with a commanding and convincing tone, not to mention a comfortable key to sing in. George puts in a pleasing performance as well, mimicking John’s acoustic guitar riff on electric guitar to add a richness that makes it distinct from most other Beatles songs to date. Actually, no rhythm instrument is heard at all in the verses of this song, both guitars playing the guitar riff to allow for airiness in the arrangement. 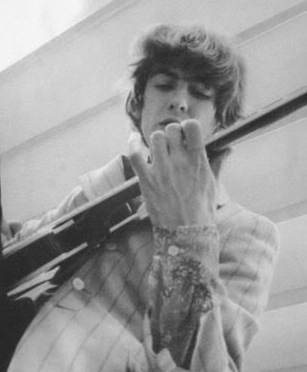 The guitar solo is overdubbed on top of both John and George’s guitar riff, which touches on the same notes during the fifth and sixth measures to create a surreal effect. Oh yeah, George’s harmonies are good too! Lyrically, the song was written with no pretenses, no misgivings and no doubts about the relationship in question. The moral of the story is simple; “she’s in love with me and I feel fine,” that is to say, ‘my baby loves me and everything is right in the world.’ This simple message may have been a throwback to the innocence of earlier Beatle visions like “All I’ve Got To Do” and “I Want To Hold Your Hand,” but in the midst of more recent Lennon-dominated compositions like “I’m A Loser” and “If I Fell,” the simple positive message contained in “I Feel Fine” comes across, not only convincing, but as a breath of fresh air. Since January 18th, 1964, The Beatles had at least one song on the American Billboard singles charts until October 24th of that year when their song “Matchbox” fell off the charts from number 52. Within this period of time, 28 different Beatles songs made it on the charts, which was more than any other artist had ever done (or probably ever will). This included songs recorded by the band as early as 1961 and was released on many American record labels, such as Vee Jay, Tollie, Atco, MGM and Swan, not to mention Capitol and Capitol Of Canada. Sadly for US Beatles fans, they were not on the Billboard singles charts for five straight weeks in the late autumn of the year. These five long weeks created a restlessness for new Beatles material in the states. Luckily, on November 23rd of 1964, Capitol rush-released the newly acquired Beatles single “I Feel Fine” with “She’s A Woman” on the b-side. Even though only a short period of time had gone by, this single was viewed as long-overdue. To help create even more demand, Los Angeles radio station KRLA somehow obtained an early copy of this disc on November 6th and immediately began playing it on the air once an hour. “We’ve received calls from Florida, New York, St. Louis, Denver and Cleveland stations,” explained KRLA Program Director Reb Foster, “offering us money and queries about where we picked up the single. We don’t feel we are (doing anything illegal) in breaking the record.” Although apparently no lawsuits were filed, Capitol kindly requested them to discontinue playing the song and asked them not to pass the song on to any other radio station. Mysteriously, though, radio station KQV in Pittsburgh played “I Feel Fine” on the air on November 11th and passed a copy to WABC in New York, who gave it airplay well before the release date. After the highly “reverbed” single was officially released, the response was incredible. It only took four weeks for it to reach the number one spot on the Billboard singles charts (from 22 to 5 to 2 to 1). Since its first of three weeks at the top of the charts was on December 26th, it became The Beatles’ sixth US number one single of 1964. This means that, because of “I Feel Fine,” they hold the all-time record of most number one singles in the same year on the US Billboard charts, even beating Elvis Presley who only had five in 1956. It was only natural for Capitol to include both sides of this current single on their December 15th released album “Beatles ’65.” This highly successful album, which spent nine weeks at number one on the Billboard album charts, included a “duophonic” (or fake) stereo version of the song on its stereo version, since they hadn’t received a stereo mix of the song from Britain. Most listeners agree that this simulated stereo version of the song is a mess, although the mono version of the album contains the “reverbed” version of the song as heard on the American single. Because of the depth of the reverb effect, though, both the mono and stereo US versions accentuate McCartney’s dog barks in the fade-out of the song. April 2nd, 1973 saw the next release of the song on the double-compilation album “The Beatles/1962-1966” (aka “The Red Album”). While British copies of this album feature the unadulterated stereo mix of the song made on November 4th, 1964, even including a second or two of whispers and sounds before the song begins, US copies still included the usual reverb mix Americans were used to hearing. The next release of the song wasn’t until October 11th, 1982 on the single-compilation album “20 Greatest Hits.” Since the US was just becoming engulfed in the MTV generation at the time, this album only proved to reach #50 on the Billboard album charts, quite low for a Beatles release. Shortly thereafter, though, the compact disc era began, and with it a desire to hear The Beatles music without the scratches and pops off of their turntables. 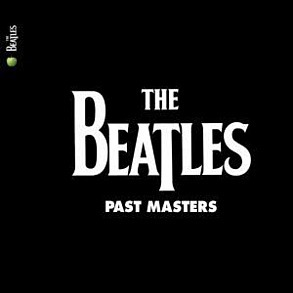 “Past Masters, Volume One” was a compilation album released on March 7th, 1988 to consolidate all The Beatles singles and EP tracks not contained on their British albums. On this release, US audiences finally had available to them the stereo mix of “I Feel Fine” without the added reverb, which sounded quite strange at first to American ears. The re-mastered stereo version was released on September 9th, 2009 under the simple title “Past Masters,” which combined both volumes of the 1988 discs. Next comes the November 30th, 1994 released double album “Live At The BBC.” The Beatles recorded “I Feel Fine” for the BBC radio show “Top Gear” on November 17th, 1964, which was broadcast on November 26th of that year. An interesting account of the recording of this version appears in the liner notes of this album: “The complete BBC session tape of ‘I Feel Fine’ reveals that the distinctive feedback opening took quite a few attempts to get right and that riff was pretty tricky too!” On November 11th, 2013, this album was re-mastered, re-packaged and re-released. March 18th, 1996 was the date that the second volume of the Anthology series of albums was released, which was appropriately titled “Anthology 2.” A live version of “I Feel Fine” that was recorded on August 1st, 1995 at the ABC Theatre in Blackpool for the television show “Blackpool Night Out” was included on this double CD, which debuted in the top spot of the Billboard album charts. The biggest selling Beatles album of all time also featured “I Feel Fine.” “Beatles 1” was released on November 13th, 2000 and went on to become the biggest selling album of the 2000s in the US and worldwide. With 27 number one Beatles songs on one inexpensive compact disc, how could you go wrong? A further release on November 15th, 2004 brought the original “Beatles ’65” album back into American homes. “The Capitol Albums, Vol. 1” is a box set that includes the original stereo and mono masters of the four Capitol albums that were originally released in 1964. So if you still prefer the “reverbed” version of “I Feel Fine,” you can still own it with this release. On September 9th, 2009, the box set “The Beatles In Mono” was released featuring the entire mono Beatles catalog in a sparkling re-mastered condition. The reverb-less “I Feel Fine” is contained on the CD “Mono Masters,” which is contained in this collection. November 11th, 2013 was the release date for the album “On Air – Live At The BBC Volume 2” which featured a quite interesting new version of “I Feel Fine” recorded at the BBC Playhouse Theater in London for the radio program “Top Gear.” This unedited session tape from November 17th, 1963 was discovered in 1988 which features the group being instructed by producer Bernie Andrews to keep recording attempts of the song until they get it right. The tape reveals Paul and John trying multiple times to get the beginning feedback right and when they do, they proceed to record the entire song. Since the BBC did not have multi-track machines, John double-tracked his vocals as an added element while this recording was being copied onto another tape. The final result was included on the above mentioned “Live At The BBC” album, while the interesting initial recording is featured here. The usual practice for The Beatles was to promote both sides of their latest single as much as possible. “I Feel Fine” not only received a lot of exposure around the time of its release but was continually played live by the group right up until they stopped touring in 1966. They starting off promoting the song on British television on the show “Thank Your Lucky Stars” (renamed “Lucky Stars Special” because of their appearance on the show). They lip-synced the song on November 14th for the show, which was broadcast on November 21st, 1964. Then on November 16th, they mimed the song once again for the TV show “Top Of The Pops,” which aired on December 3rd, 1964. BBC radio was next. On November 17th they recorded the song for the radio show “Top Gear,” which aired on November 26th, 1964. This performance was then repeated on an edition of “Saturday Club” on December 26th. Then back to TV, with a taped, lip-synced performance of the song for “Ready, Steady, Go!” on November 23rd. This show was broadcast on November 27th. They did interrupt their filming schedule to appear in the “New Musical Express 1964-1965 Annual Poll-Winners’ All-Star Concert” on April 11th, 1965. Highlights of this show were broadcast on British television on the show “Poll Winners Concert” on April 18th of that year. A brief European tour, which included “I Feel Fine” in their set list, began on June 20th, 1965 in Paris. The entire afternoon performance on this date was taped and broadcast on French radio. 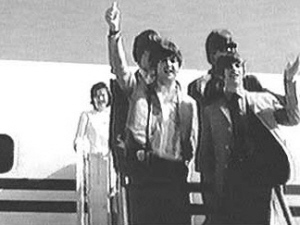 The tour progressed through France, Italy and Spain until July 3rd, 1965. Two television performances of the song were made in August of 1965, the first for the British variety show “Blackpool Night Out,” which was a live broadcast on August 1st. Then they taped a performance in New York City for American television on August 14th, their fourth appearance on “The Ed Sullivan Show.” This segment wasn’t broadcast until September 12th, which was the first program for the new fall season. The second half of August saw The Beatles engage in their second extensive American Tour, which began with the legendary Shea Stadium concert in New York City on August 15th, 1965. With “I Feel Fine” as the third song of their set, they jumped around North America with hot spots in Atlanta, Houston and Toronto – including their Hollywood Bowl concerts in Los Angeles on August 29th and 30th. 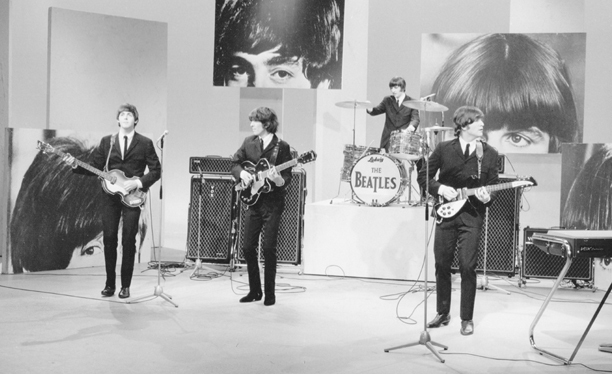 Because The Beatles were ever more reluctant to appear on television shows to promote new singles, they filmed numerous lip-synced videos of a few of their recent singles for distribution to TV stations. They set aside November 23rd, 1965 to enter Twickenham Film Studios to create these films. Curiously, they mimed two off-beat videos for the year old “I Feel Fine,” the first of which showed them performing the song amongst exercise equipment (Ringo riding an exercise bike). The second video shows them scarcely even attempting to lip-sync to the song while they all ate newspaper-wrapped fish and chips. The British TV program “Top Of The Pops ’65” showed the first clip on both December 25th and 26th, while the second “fish and chips” video was never seen anywhere (since Brian Epstein was unhappy with the film). The Beatles then commenced with what became their last British tour, which spanned from December 3rd in Glasgow to December 12th in Cardiff. This tour, which included stops in London, Manchester, Birmingham and their last ever concert in Liverpool, began with “I Feel Fine” at the top of the set list. Being comfortable with the song, they continued to perform it throughout 1966, as first evidenced in their final appearance on the “New Musical Express Annual Poll-Winners’ All-Star Concert” in Wembley on May 1st. Their brief international concert tour, which ran from June 24th in Munich to the infamous July 4th show in The Philippines, included it as the sixth song in their eleven song set list. Finally, The Beatles third American tour, from August 12th in Chicago to August 29th in San Francisco, included the exact same set list. Therefore “I Feel Fine” was performed at the very last concert they ever performed (other than the Apple rooftop show of January 30th, 1969). While much can be found in print and in Beatle interviews explaining the origin and originality of the feedback introduction to “I Feel Fine,” what shouldn’t be overlooked is the driving energy and innocent charm of the song as a whole. The attack of the melodic riff, which is the central figure of the entire song, propels the band through one of their most convincing performances to date. Undeniably this song can be described as a ‘rocker,’ but in combination with lyrics that everyone on the planet can relate to, “I Feel Fine” is truly a “feel good” song.